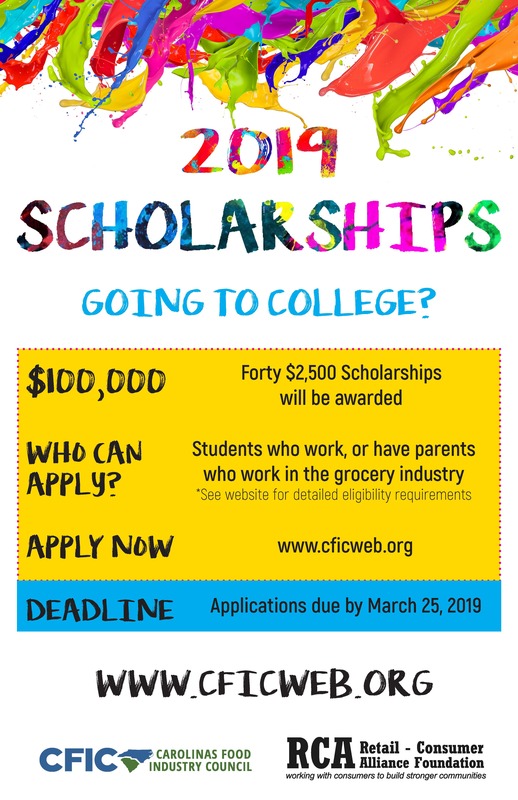 The Carolinas Food Industry Council (CFIC) is proud to offer employees of its member companies the opportunity to apply to win a $2,500 Everett & Trudy Suddreth Scholarship of Excellence Award. Funded by the Council’s charitable foundation, the Retail Consumer Alliance (RCA), this scholarship is awarded annually to a total of 40 deserving students. 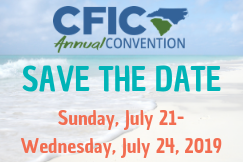 NOTE: The food industry employee (whether a parent or student) must work at a CFIC Member Company location in North or South Carolina, and must be employed at the time the winners are selected. Qualified scholarship recipients may attend a college located in any state. High School Seniors enrolling for the 2019 fall semester as College Freshmen and College Undergraduates enrolling for the 2019 fall semester. Students who have previously received a CFIC scholarship are eligible to apply again. NOTE: Extra credit will be given to students who are currently employed in the grocery industry and/or students who are enrolled in a food industry undergraduate curriculum (i.e. Culinary Arts). Print a copy of the application. If you need an application mailed please call (919) 832-0811. Mail completed application and official transcript to CFIC, Attn: Scholarship, PO Box 1030, Raleigh, NC 27602. Completed applications and official transcripts must be post-marked by Monday, March 25, 2019. Scholarship winners will be selected by an independent panel of educators. All applicants will be notified via e-mail in June. Winners must be enrolled in college full-time for the 2019 fall semester. Scholarship awards will be mailed directly to the student and made payable to the college. Click here to print a poster for your business or school. If you have any questions, please contact Sarah Cribb at (919) 832-0811 or via email sarahc@ncrma.org.